The TCP is a developmentally-appropriate measure of the youth's skills, knowledge and behaviours, initiated at 12 years of age in the pediatric setting and completed at age 24 in the adult system. Age-sensitive, developmentally-appropriate indicators for youth-focused care and transition readiness. Youth-centered written strengths, concerns and goals on transfer. Indicators within the Transition Pathways correlate directly to the Youth Quiz and Parent & Family Checklist (integrated self-assessment tools for patients and families). Every item on the Youth Quiz and Parent & Family Checklist is linked directly to specialized resources in the Youth Toolkit and Family Toolkit to support self-directed learning. Provides direction for standardized processes, benchmarking, and accreditation. Through funding from the Doctors of BC Shared Care Committee, this work began in January 2012 and suggested content for the MTS was established. The Medical Transfer Summary (MTS) was developed utilizing the Professional Standards and Guidelines regarding referrals from the College of Physicians and Surgeons of British Columbia. Hospital based Dictation Code 102 (Transfer Summary) should be used for all Medical Transfer Summaries (MTS) dictated through BC Transcription Services. This facilitates distribution of information to patients (my ehealth) and all healthcare providers/healthcare institutions (Excelleris/CareConnect). Ensure that a comprehensive medical history and plan of care accompanies every youth with chronic health conditions at the time of transfer from pediatric to adult physicians. Enhance continuity of care and shared care between pediatric and adult physicians. Enhance shared care between family practitioners and adult specialists. Improve attachment of youth to adult care providers, especially their family practitioners. The Transfer Referral Cover Sheet is the cover sheet used when sending a "Request for the Transfer of Care" to an Adult Specialist. If confirmation has been previously confirmed, it can also be used as a cover sheet for the Transition Transfer Package. Am I ON TRAC for Adult Care? is a youth readiness questionnaire developed in 1998 (revised in 2012) as a tool to help youth self-identify their own learning and skill needs as they prepare for the transfer to the adult health care system and adulthood. In 2012, the 25 item assessment tool was validated with 200 youth from various clinics at BC Children’s Hospital for youth 12-19 years of age with a CHC/D. The study validated the psychometric properties of the questionnaire which means that most young people in this age range (12-19 years of age) will understand and respond to the questions in consistent ways. In addition, the Am I ON TRAC - Parent Version was given to parents of the youth, comparing the level of agreement (concordance) between the youth and parent responses. The study was the master’s thesis of Melissa Moynihan RN MSN, guided by Dr. Elizabeth Saewyc (PI) from the University of British Columbia School of Nursing. Assessing adolescent readiness to transition (International Association of Adolescent Health). 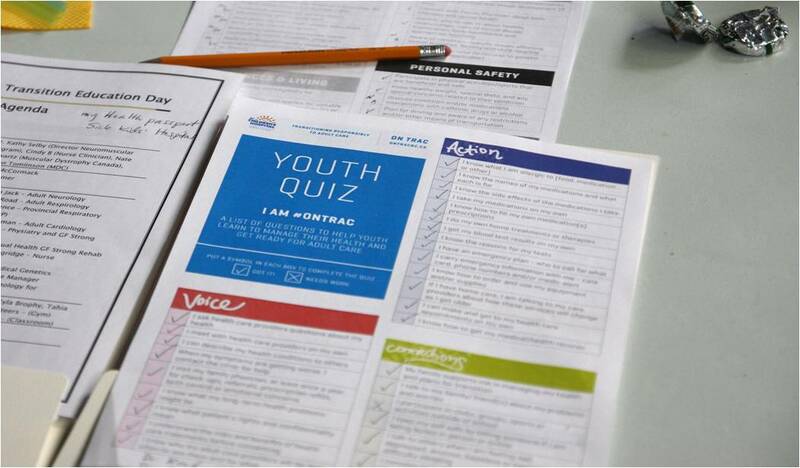 The Youth Quiz is a 48 item checklist that includes the 25 knowledge and behaviour indicators that are in the validated Am I ON TRAC youth readiness questionnaire. It is posted online within the ON TRAC Youth Toolkit and is downloadable to phone, tablet, and computer. It can be used for youth and families at every clinic visit to track areas to work on, as a companion to the overall readiness assessment. In addition, each indicator is hyperlinked to an Activity Card in the online Youth Toolkit to support youth in developing the skills or knowledge described by the indicator. Similarly, the Parent & Family Checklist, built from the Am I ON TRAC - Parent Version, has 46 indicators that include the 25 indicators from the study also linked to Activity Cards in the Family Toolkit. Each indicator on the Youth Quiz correlates directly to indicators in the clinicians' Transition Clinical Pathway (Simple) and on the Parent & Family Checklist to the Transition Clinical Pathway (Complex). These combined tools offer a process for youth- and family-focused transition assessment, screening, intervention and evaluation.